You can’t pour from an empty pitcher. 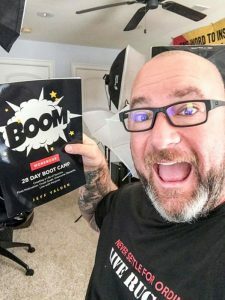 In Episode 29 of The BOOM Podcast, motivational speaker and Amazon bestselling author Jeff Yalden continues to lay out the principles from his brand-new, hot-of the press workbook, The BOOM 28 Day Boot Camp: Creating a Life of Success. Find Motivation. Crush Goals. Overcome Obstacles. Live with Purpose. “You need to fill yourself up so emotionally you can be present and engaged, you can deliver; you can offer help and inspire others – but you can’t do that if you are running on empty yourself,” he said. What is your choice for success? Yalden said that we allocate time for all sorts of things: Social media, getting ready for work in the morning and having a good breakfast [breakfast is super-important]. We allocate time for friends and for exercise and many other daily and weekly tasks. But one thing we don’t allocate enough time for is self-care. “I know some people might think that self-care is selfish. Listen – self-care is one of the most important things you can do every single day,” he said. Yalden has a daily plan that includes personal and business responsibilities, and it’s broken up into morning, afternoon and evening. He is sure to tackle his responsibility to himself – his self-care – in the morning. Just like GPS, a daily plan is a map that can guide you successfully to the end of your busy day. “What is the time that you are going to allocate to yourself on your life of success? Is it going to be from 5:30 to 7:30 in the morning? I get it. Maybe you need to get up at like 4:45 and that’s where you might journal until 5:30. Maybe that’s where you spend ten minutes of reading. Maybe you meditate or breathe – inhale peace, exhale love. The upshot is this: If you are really committed to making changes in your life – big or small – you have to refocus and readjust your commitments, responsibilities and your obligations. “Responsibilities and obligations come before your rights and privileges, he said. Let’s say you go out every Friday night to party with your friends. Success is not easy. Being average is much easier than being successful. Do you want a life of just being average, or do you want a life of success?